The Story of My Life tells the innocuous tale of Thomas Weaver (Will Chase) and Alvin Kelby (Malcolm Gets) and their relationship from childhood to Alvin’s premature death. The story opens with Thomas standing at a podium attempting to write a eulogy for his old friend Alvin. There is a small open portal in the stage just behind the podium that opens to reveal Alvin sitting on top of a ladder bathed in white light. I don’t think I’m giving anything away here by saying that he is dead. Thomas is a successful writer who writes what he knows. His stories are based upon his childhood experiences with Alvin and center around Alvin’s father’s bookstore, ironically named the Writer’s Block. 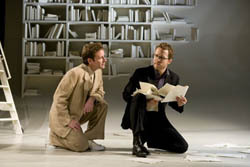 The set, by Robert Brill is a monochromatic white cyclorama-like back wall that curves to the ceiling with bookshelves. The blank books on the bookshelf serve double duty. They represent both the book store and the wealth of stories in Thomas’s head. They continually reference the books as they hearken back to childhood memories that bring about the next song in the story line. The musical uses the Frank Capra movie “It’s a Wonderful Life” as a common thread both boys remember from childhood. Alvin’s death is due from what we are led to believe is a suicide seemingly brought on by Thomas’ rejection of him. Even this mirrors the Capra classic as it is inferred that Alvin killed himself by jumping off a bridge. You’ll remember that George Bailey is stopped from jumping off a bridge by Clarence the angel to show George what the world would have been like without him. At the end of the night we are left asking “so what.” If only this musical had the dynamic emotional punch found in the aforementioned holiday classic. There is nothing compelling about this story. There is barely any conflict. The two characters go on to lead different, yet similar lives in that one writes books and one sells books. The similarities appear to end there. After planning a trip to visit his successful friend, Thomas abruptly cancels the trip and we are led to believe that this brings about Alvin’s death. The performances by Mr. Chase and Mr. Gets are stellar. These are talented men giving it their all. Both men are in fine voice. The music and lyrics by Neil Bartram are serviceable but not memorable. The book is by Brian Hill. The show is handily directed by Richard Maltby, Jr. and maintains a brisk pace but to no avail. The orchestrations are by the talented Jonathan Tunick. Tunick’s work, frequently associated with the work of Stephen Sondheim seems thin here. The ensemble is comprised of nine musicians yet it doesn’t feel that way. Props to Mr. Tunick though for his use of instruments less and less frequently associated with Broadway musicals (bassoon, viola and other real string instruments). The Story of My Life: Music and lyrics by Neil Bartram; book by Brian Hill; directed by Richard Maltby Jr.; sets by Robert Brill; costumes by Wade Laboissonniere; lighting by Ken Billington and Paul Toben; sound by Peter Fitzgerald and Carl Casella; projection design by Dustin O’Neill; orchestrations by Jonathan Tunick; music director, David Holcenberg; music coordinator, John Miller; production stage manager, Bess Marie Glorioso; production supervisors, Arthur Siccardi and Patrick Sullivan; associate director, Lisa Shriver; general manager, Leonard Soloway. Presented by Chase Mishkin, Jack M. Dalgleish, Bud Martin and Carole L. Haber, in association with Chunsoo Shin. At the Booth Theater, 222 West 45th Street, Manhattan; Running time: 1 hour 30 minutes.